Zac Efron, Macie Carmosino and Lily Collins appear in Extremely Wicked, Shockingly Evil and Vile directed by Joe Berlinger, an official selection of the Premieres program the 2019 Sundance Film Festival. Courtesy of Sundance Institute | photo by Brian Douglas. All photos are copyrighted and may be used by press only for the purpose of news or editorial coverage of Sundance Institute programs. Photos must be accompanied by a credit to the photographer and/or 'Courtesy of Sundance Institute.' Unauthorized use, alteration, reproduction or sale of logos and/or photos is strictly prohibited. 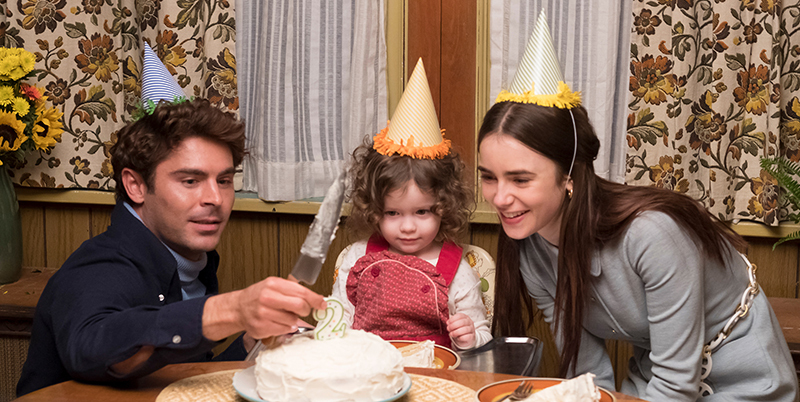 It is difficult to ignore the “controversy” surrounding Extremely Wicked, Shockingly Evil and Vile, starring Zac Efron as Ted Bundy and Lily Collins as Bundy’s longtime girlfriend, Liz. The controversy has to do with many people believing the trailer, and Efron’s performance, would romanticize Bundy or disrespect his victims. As a true crime fan who knew a little about Bundy going into the film, I felt that the film was meticulously detailed, thrilling, and respectfully done. The film is not a catalog of Bundy’s crimes, but rather focuses on the manipulation of the people around him and how those people were left to cope with the aftermath. Extremely Wicked, Shockingly Evil and Vile offers a view of Bundy through Liz’s eyes, showing how supportive she was throughout the initial process of his trials. While Bundy successfully cajoles Liz into loving him, she is tortured by the grisly details of the trials as well as her own doubts about Bundy. The violence and brutality is kept to a minimum in the film, and is mostly confined to what was discussed by detectives and prosecutors at his trials. Bundy’s influence on Liz is portrayed as entirely manipulative and subtle, and the film glaringly reminds viewers how even the most level-headed, intelligent people were able to fall for his charms. Efron’s portrayal of Bundy is charismatic and chilling at the same time, and is so convincing from Liz’s point of view, I even wondered if Efron’s Bundy could be capable of murder. Efron balances Bundy’s character with an absurd sense of confidence and hints of murderous rage. Collins’ performance is astounding and heartbreaking, highlighting the conflict between Liz’s feelings for Bundy while being plagued with the gnawing suspicion that he may be a murderer. Collins clearly translates the heartbreak of a self-doubting woman who was truly in love with Bundy, as well as her resolve to move on with her life as reality became too gruesome to ignore. For me, Extremely Wicked, Shockingly Evil and Vile excelled in attention to details. Early on in the relationship, gestures that made Liz fall in love with Bundy hinted at a subtle, murderous edge. In one scene, Bundy holds a butcher knife in his hand while making breakfast for Liz and her daughter, while in another scene, he playfully pretends to bite her and holds his hand up to her throat while he kisses her. I personally remember hearing that the real-life Bundy subconsciously picked out victims who had a middle part in their hair. Collins’s hair is parted down the middle in every scene, except at the beginning when Liz first meets Bundy, and at the very end of the movie, a symbol that Liz can no longer be his victim. Bundy’s trial in Florida on capital murder charges, which was widely televised and famously became a media spectacle, was brilliantly captured in Extremely Wicked, Shockingly Evil and Vile. The dichotomy between the actual legal proceedings was weighed against the charm Bundy was able to impose upon his captive audience. During the credits of the film, clips of the actual Bundy trial were shown, and the juxtaposition of the real events to the fictionalized ones reinforces the brilliant exchange between Efron and John Malkovich as Judge Edward D. Cowart.